If you’re a certain age, you might remember those strobe disco lights from the 70s and how they not only slowed down action, but captured and unnaturally suspended a singular moment. I can still see my college roommate’s expression while she danced at the disco we went to in her Brooklyn neighborhood that had been featured in Saturday Night Fever. Time stood fragmented in shards, as if broken like glass. A couple moments in the past week have likewise entered my heart’s memory as if they happened in the presence of a strobe: our sheep Juniper violently head butting her two day old lamb away from her as the lamb attempted to nurse and my youngest Ben grabbing his head and falling to the ground when a football hit his eye. Juniper’s sweet little black lamb with wisps of white on her face and edging her ears was born on Sunday evening May 21st. 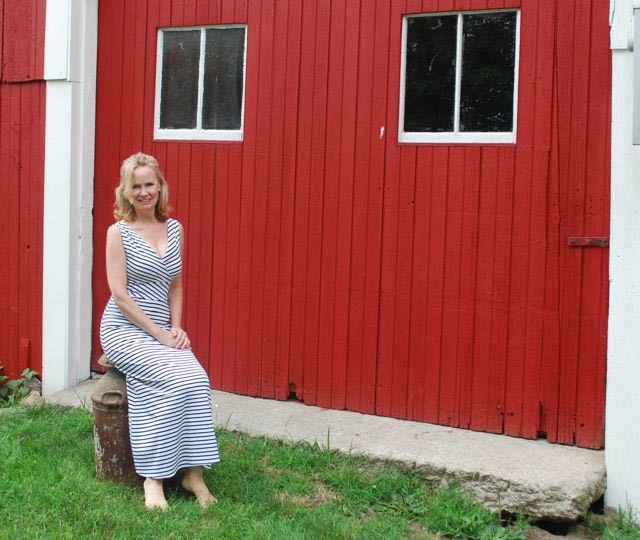 I first heard her call when I entered the barn on Monday morning to feed the animals. The newborn lamb was already dry and standing. I held my breath as I watched the tiny lamb trying to nurse. Juniper’s long teats appeared to be too low from the tiny mouth to grab. Over hours of watching, she eventually started to suckle. By lunch I was satisfied all was well and left. I returned at 3:00 to find a frantic lamb, hungrily crying. By 5:00 she was nearly listless in a corner; I knew we had a problem. I called Evan, our farm camp manager, and asked him to come. 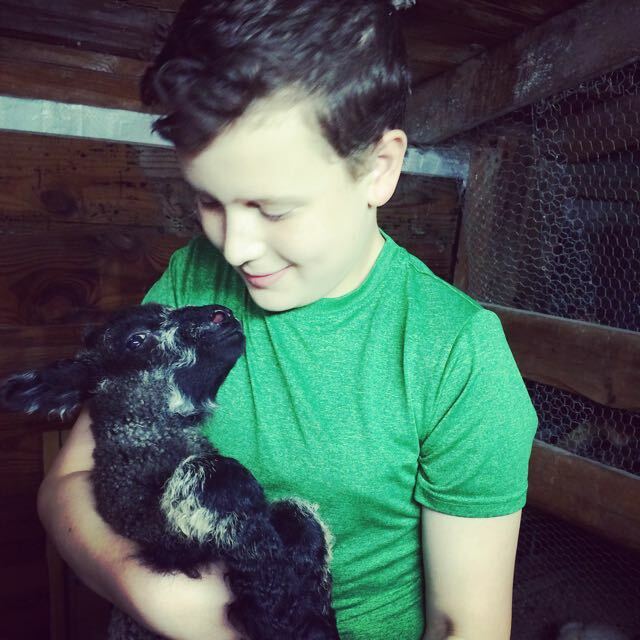 It was he who noticed that Juniper had a third, nonfunctioning teat that the lamb had been unsuccessfully suckling. The poor lamb had yet to eat. Colostrum is the first milk and must be given to the lamb within the first 12 hours since birth to build a proper immune system, so we milked Juniper and bottle fed the lamb before she lay like a rag doll on our arms sound asleep, “milk drunk” and fatigued from a day of being born into a world where only hunger greeted her. The lamb was content, but had so far failed to nurse. Luna, milk drunk, with her arm sprayed out in the exact position where she fell asleep once she was finally fed. 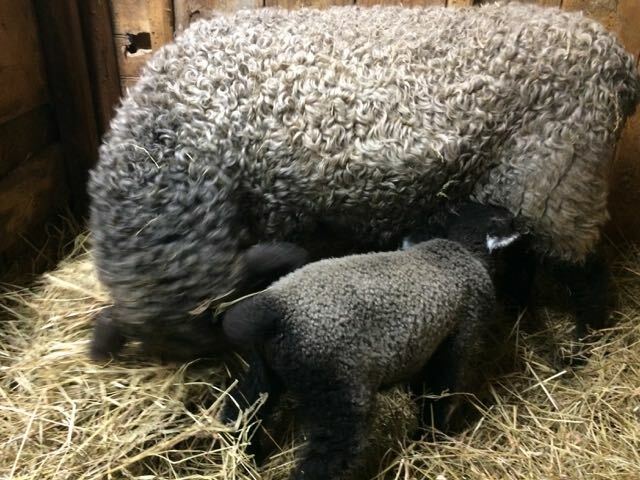 In this first lambing season, we’ve learned so much about nursing from watching Juniper’s flock mate Juliette successfully bond and latch with her lamb Lulu. 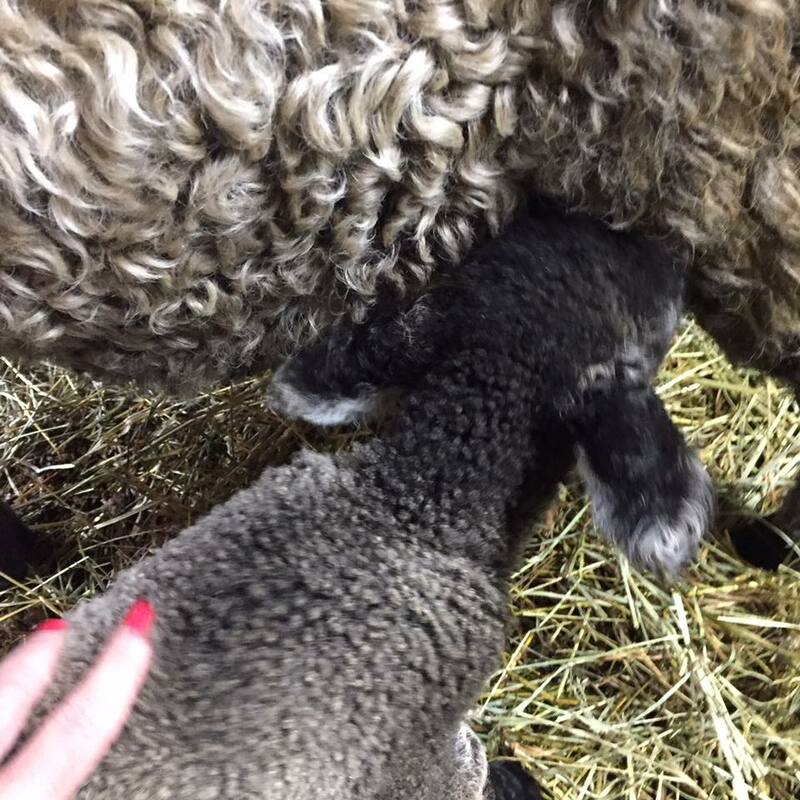 Weeks ago, I had stood awestruck watching Juliette minutes after giving birth, as she nudged her newborn lamb’s hind quarters with her nose to her udder while the baby latched. The mother continued to nudge the baby’s hind quarters while she nursed, together forming a perfect circle of connection. 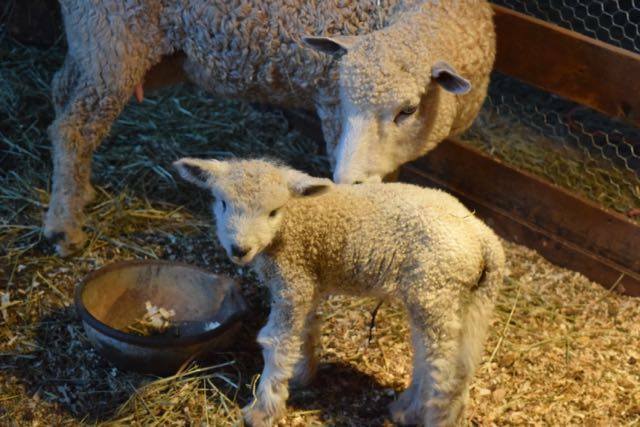 Lulu lamb with her mother, Juliette. But Juniper did not want her baby to latch; she pushed her away. I called the vet and asked for advice. Dr. Rosario suggested putting Vicks vapor rub in Juniper’s nose, so she’s wouldn’t be able to smell the baby. Apparently, this sometimes works. But it did not. A night of trial and error taught us that the only thing that worked was inserting ourselves between the mother and the lamb. We would crouch and scratch Juniper’s head, while also patting the lamb’s hind quarters and the mother would settle; the baby would latch. It was as if we were completing an electrical circuit of contact between the mother and her offspring. I was in the barn helping the newborn baby nurse, among other chores, on Memorial Day weekend when I heard my own youngest child crying. Ben, age 10, had been hit by a football thrown by his brother without adequate warning. The ball hit him squarely in the eye. Ben hit the ground, holding his head in both hands, a single stream of blood stretching from his eye to his chin. He had blacked out momentarily. The on-call pediatrician advised me to by-pass our local city hospitals and take him directly to Children’s Hospital in Boston, “because of the nature of the injury,” she explained ominously. He would need an on-call pediatric ophthalmologist. I could hardly breathe as I drove the familiar route into Boston, talking to Ben to make sure he was still cognitively alert and occasionally glancing in the rear view mirror nervously. Six hours later after observation and a thorough eye exam, we returned home from Boston with eye drops Ben would need four times a day for a bleed in his eye and guidelines for managing a concussion. Juniper also needed to be fed four times a day, so I put them both on the same schedule and cancelled everything to watch for the list of neurological signs of resumed bleeding in Ben’s head or eye. Each time I’d lean in to scratch Juniper’s head and watch her reluctantly nurse, I’d worry about my human baby and the half hour I was not vigilantly watching him. But as the days stretched on into weeks and my fatigue rose, my heart also went out to the new mother sheep. I don’t think any of us mothers have been spared days when the hard edges of what’s required of giving yourself over to our children hasn’t left us spent, feeling reluctant at best or resentful at worst. The big picture is not always immediately available to us in the moments when a hungry baby can’t wait and your own swollen body hurts from the strain of birth and nursing. These moments of parenting can feel fragmented and disproportionate in its request of us as if under a strobe. Or sometimes we fear we might not be quite equal to the task. What if we can’t figure out how to feed the baby or we miss a symptom of a brain or eye bleed? My childhood friend Kathy (Goff) Bucchino helping Luna nurse. 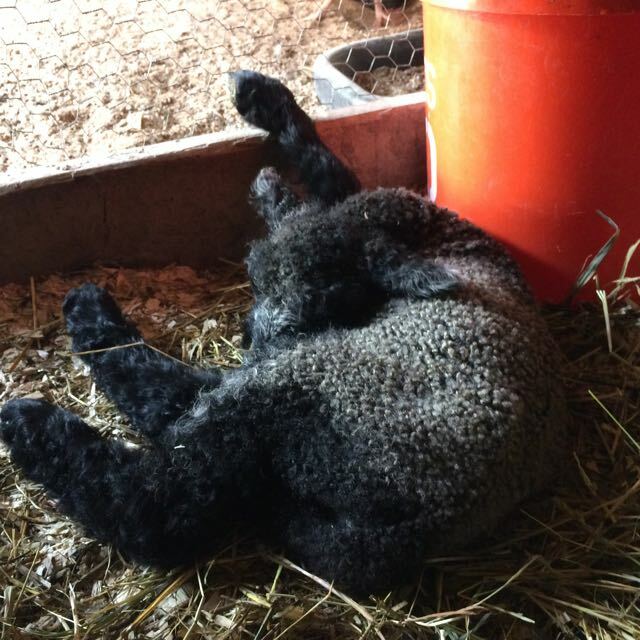 In the weeks since Luna was born and Ben was injured, we’ve employed a legion of dear friends and family to meet the needs of a newborn lamb and to cover pickups of older siblings at sports and other events while Ben goes to followup appointments. It takes a village, I’m reminded. And as Juniper has taught us: sometimes it takes someone else mitigating between us and our problems as if completing an electrical circuit. It’s there, in that spark, where the shards of glass against which we have uncomfortably strained become again whole. Our middle son Zach with Luna after helping with a feeding. Hope Ben and Luna are both still doing well. Both are doing much better, thankfully, Ken! Thanks so much for you well wishes!